SAME WISH is a big bodied Blue Roan that has a lacey face. Her Sire is SAMARITAN out of REALITY CHECK and VIRTUAL REALITY. Her Dam is POWER WISH out of OVER POWER! She measures 64.5 inches TTT and 83.5 TH! 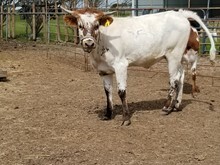 WISH has had a gorgeous red & white bull calf on April 09, 2019! The Sire is WS ELEVATION, the genetics of these 2 are amazing! This bull calf is red & white but flashy. His white body is covered with red speckles.